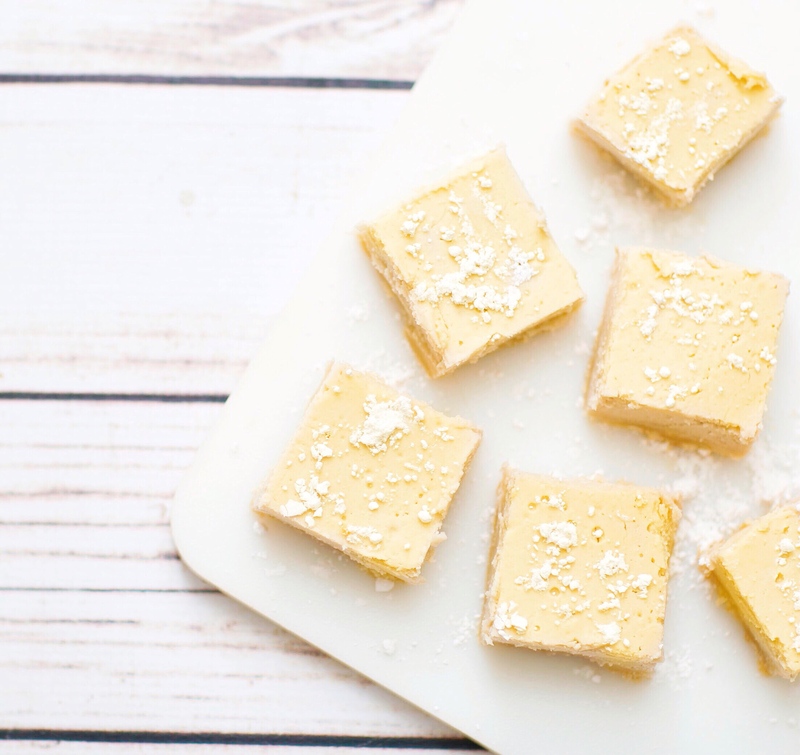 Today’s recipe is my current favorite dessert: lemon bars. 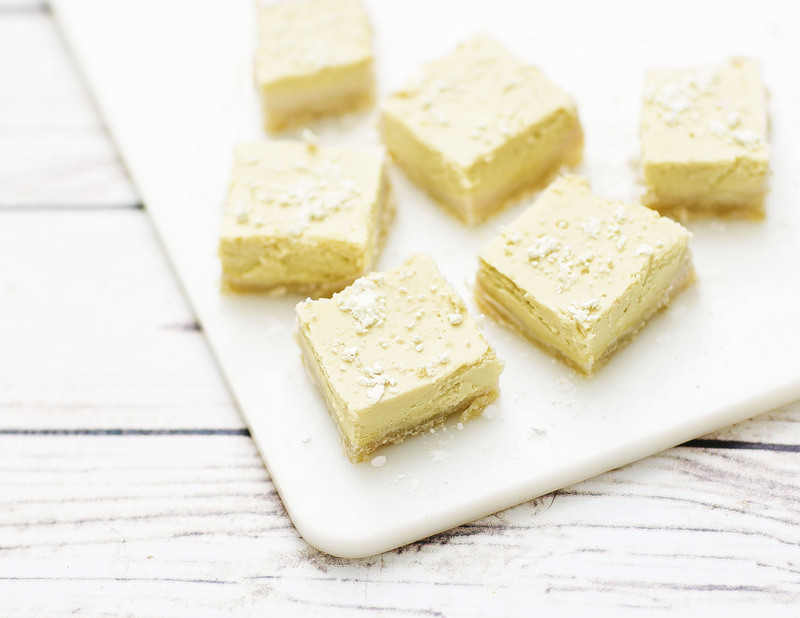 I tried to make my boyfriend a replacement for his favorite vegan lemon tart that the store stopped carrying, and we ended up with something even better: these lemon bars are the perfect hybrid of creamy cheesecake texture with bright lemon bar flavor. Featuring a shortbread crust and cashew-coconut filling, they’re a hit for vegans and omnivores alike! Combine ingredients in a bowl, and massage butter and lemon juice into sugar and flour until it forms an even dough, without lumps. 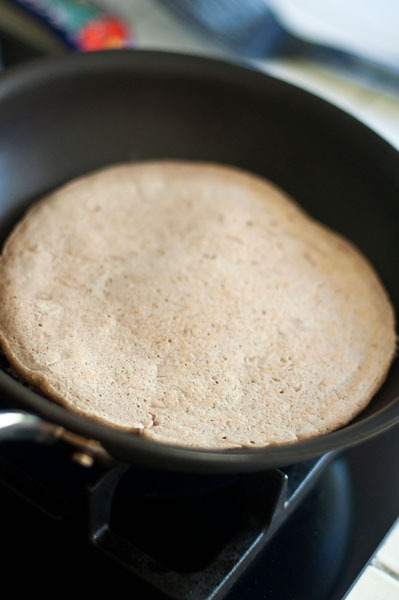 Line an 8″ round pan with parchment paper, and press the dough into the pan. Bake at 350 for 15 mins. Remove from oven and let it cool for a few minutes. Blend all ingredients except powdered sugar until smooth and creamy. Pour into half baked crust and bake at 350 for 20-25 mins, until edges start to crack. Remove from oven to cool for 30 minutes, then transfer to fridge. Let cool overnight, sprinkle with powdered sugar, and enjoy! *Coconut cream is the hard part at the top of a can of full-fat coconut milk that has a butter-like consistency; not the liquid. You can also buy cans of pure coconut cream. I came up with this recipe years ago, and I’ve never gotten tired of it: I still find myself making it on the weekends. 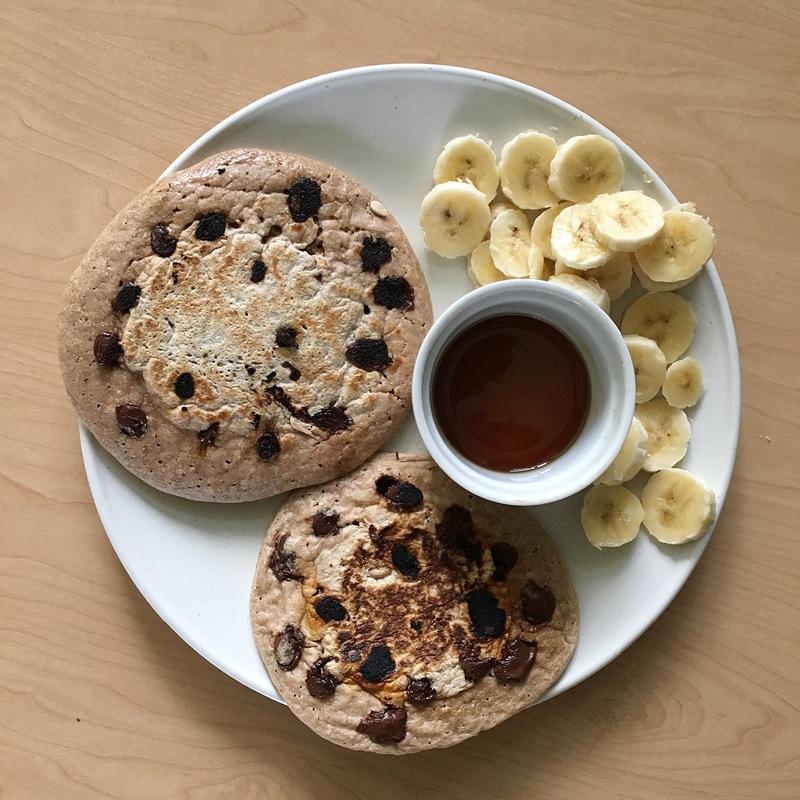 It’s a healthy start to your day, and is easy to dress up as you please–I usually opt for chocolate chips, with banana slices and maple syrup on top! 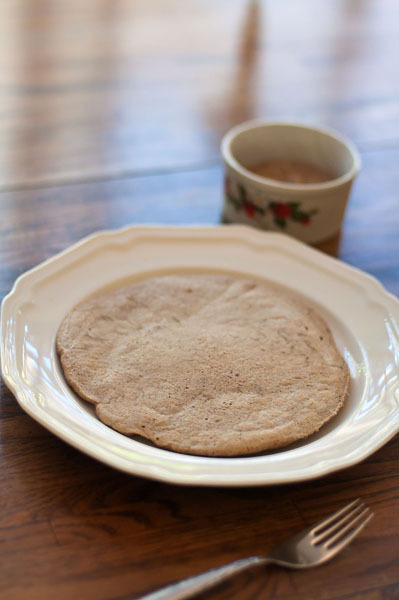 It’s also easy to make your own pancake mix for this: what I like to do is mix up a tupperware-full of the dry ingredients, and use that throughout the weekend. That way I can just roll out of bed, add the wet ingredients, and start cooking the pancakes right away! Add-ins: Chocolate chips, nuts, berries, cinnamon, etc. 1. In a small to medium bowl, mix together the dry ingredients: flour, brown sugar, baking powder, and salt. 2. Pour vanilla, soymilk, and water into a well in the center of the dry ingredients. Whisk until lumps are gone, and stir in addins if desired. Note: I often find myself adding more liquid at this step as I like a thinner batter sometimes, but the thickness is really a matter of preference: they turn out great regardless! 3. Coat skillet with cooking spray, and set to medium heat. Once the skillet is hot, pour the batter until your desired pancake size is reached (generally around 1/3 cup; I, however, made a giant pancake). Drop your add-ins like chocolate chips evenly into the batter. 4. Cook until bubbles have appeared and popped on surface, then flip to other side. Cook until browned. 5. Serve with your favorite toppings. Although we don’t get to experience much of a real winter where I am in California, I still can’t help but love soup season. I’ve been experimenting with spicy lentil, roasted tomato, and sweet potato soups over the last few weeks, but I keep coming back to this broccoli one. Yukon gold potato lends the soup its creaminess, and the cheesy flavor comes from nutritional yeast, along with onions, garlic, and a few cashews. 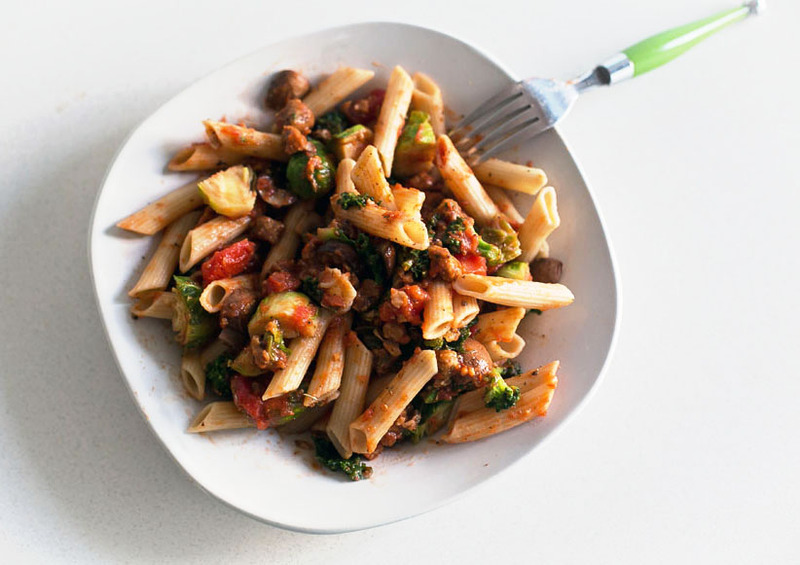 It’s also flexible and fun to customize: you can add whatever veggies you have on hand, and vary amounts as you please and it’ll still turn out great. It’s packed with nutrients (and even quite high in protein! 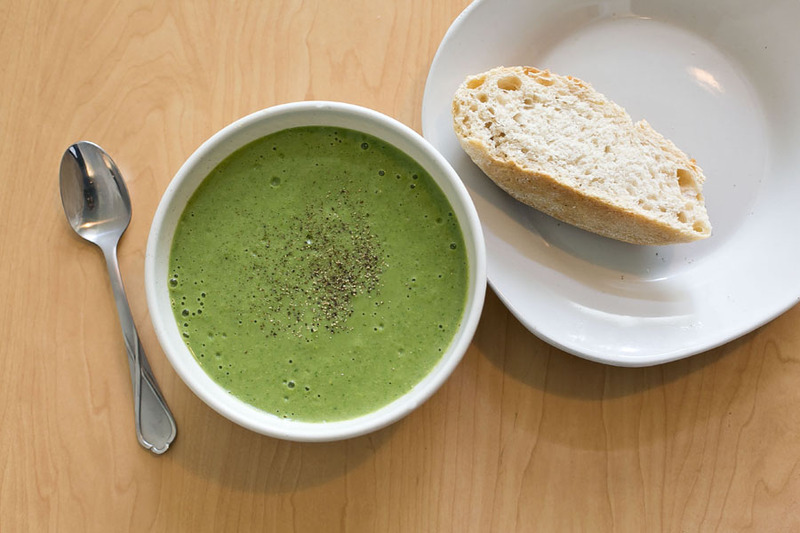 ), it’s quick and easy to make, and it’s especially delicious when paired with toasted sourdough! Boil or microwave potato until soft. Roughly chop the garlic, onion, celery, and mushrooms. They’ll all be blended later, so just chop them enough so they have some surface area for cooking. Dry-sauté garlic and onion over medium heat until the garlic toasts slightly, then add the water, broccoli, celery, mushrooms, potato, and kale or spinach. Simmer until soft. Remove from heat, and add to blender along with cashews, nutritional yeast, and almond milk. Blend until smooth and creamy. 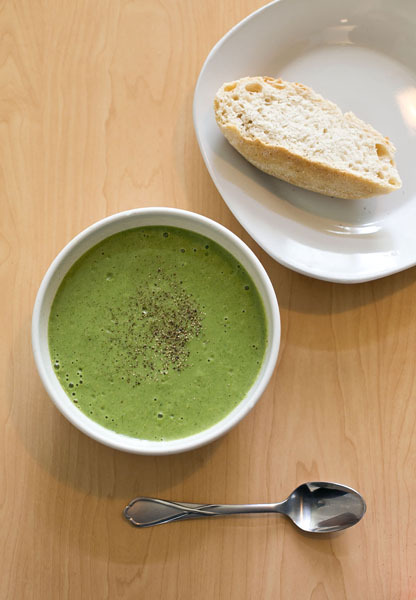 Add more water and/or almond milk as necessary to get soup to the consistency you prefer. 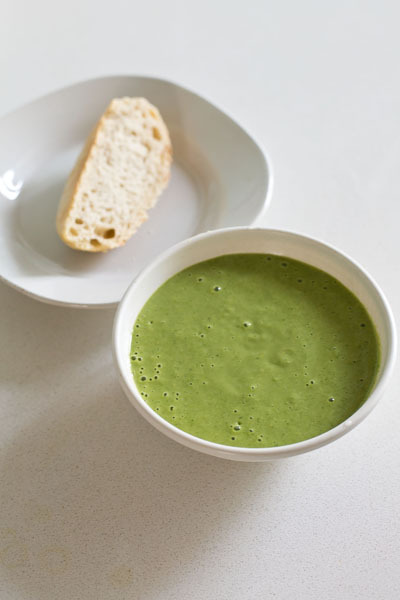 Serve with freshly toasted bread, and enjoy! 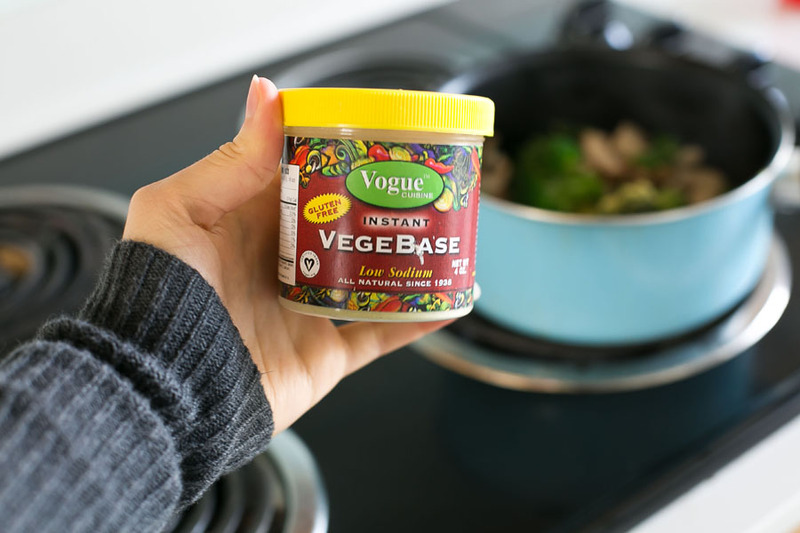 Side note: I’ve been in love with this broth powder since I discovered it a month ago… finally a way to make broth that is both oil free and lasts indefinitely! Ever since I went to college three years ago, the biggest obstacle to being 100% vegan was an Indian restaurant called Biryani house. My college town is teeming with vegan options, but this place had the absolute best food I’d ever tasted in my life. And that’s a big deal for me, because I’ve had the good fortune of eating at a lot of great restaurants. I used to go there with friends a couple of times a month to gorge myself on their freshly baked aloo naan, perfectly spiced vegetable biryani, and most importantly, their decadent paneer tikka masala. 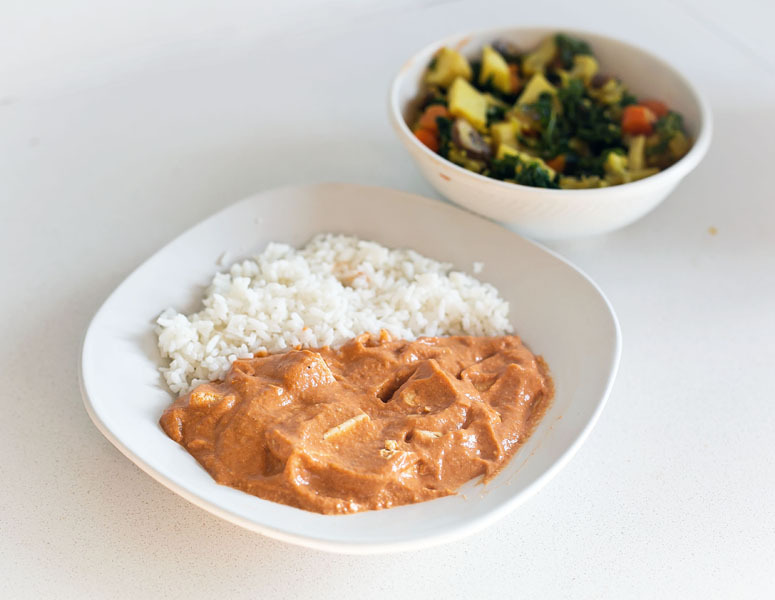 Unfortunately, my vegan aspirations were dashed due to the fact that their tikka masala not only sported paneer (cubes of Indian cottage cheese), but was also likely drowned in heavy cream. When I finally got more serious about being 100% vegan last year, I had to stop going there. And as if to enforce my self-discipline, it actually closed a few weeks after my decision, for unknown reasons. A bittersweet moment. 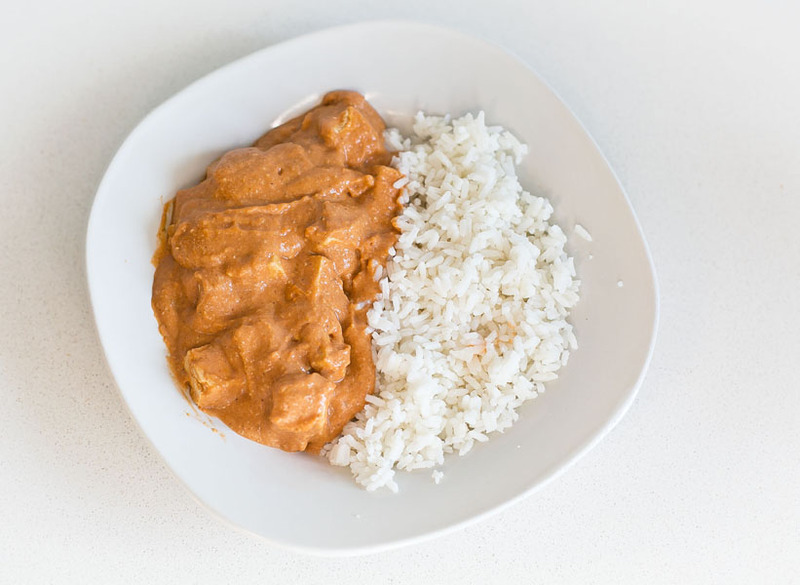 Anyways, getting to the point: I’ve been trying to recreate that tikka masala for quite awhile now. After a few tries–all of which were delicious, but not decadent like theirs–I finally came up with a recipe that tasted almost the same. 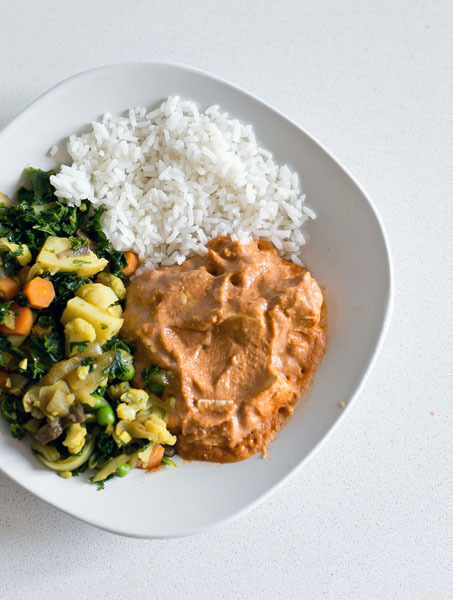 It’s creamy, spicy, much healthier than its restaurant counterpart, and most importantly, vegan. And I’m pretty darn excited about it. Now to work on aloo naan recipes! 1. Cut up the onion and garlic, and combine them with the tomato sauce in a large pan over medium heat. Add in the cumin, cardamom, coriander, ginger, nutmeg, cayenne, paprika, and amchur powder, and simmer for about 15 minutes. 2. While the sauce is simmering, cut your tofu into cubes, and fry until golden (I used a teaspoon of coconut oil, but you could also do it dry). Remove from heat once golden. 3. After 15 minutes, remove the sauce from heat. Allow to cool (if necessary; I didn’t have to for my vitamix) and blend with the drained cashews until smooth and creamy. Add unsweetened almond or cashew milk as needed to get it to your desired consistency. 4. 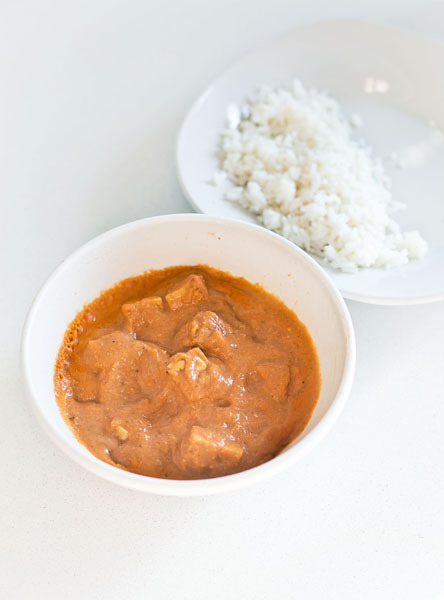 Combine tofu with sauce in a serving bowl, and serve it with jasmine rice, naan, your preferred grain, or enjoy it solo! I’m starting to fall in love with bulk cooking. Not only am I free from prepping food and dish-washing each and every night, but it leaves me more time and energy for the gym. Talk about a win-win! For my second bulk dish, I went with a burrito bowl since I’d had burrito cravings for days. 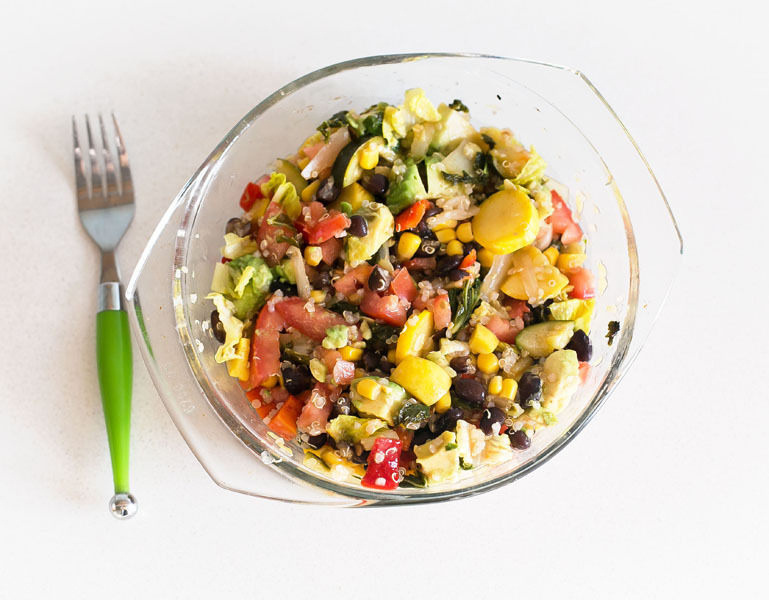 The reason I’m calling this particular recipe a piñata bowl is because it’s a bit of an explosion of color–with lots of green, red, and yellow–and is rather pretty to look at. And more importantly, it tasted AMAZING. It lasted me five nights, and I found myself looking forward to it every night. I was sure I’d get bored of eating the same thing even three nights in a row, let alone 5, but this bowl has proven me wrong! Not only is it delicious, but it’s got plenty of protein and fiber and can be made nearly fat free if you omit the avocado. Perfect for those on a high carb lifestyle, and for those looking to eat a giant burrito equivalent for way fewer calories! 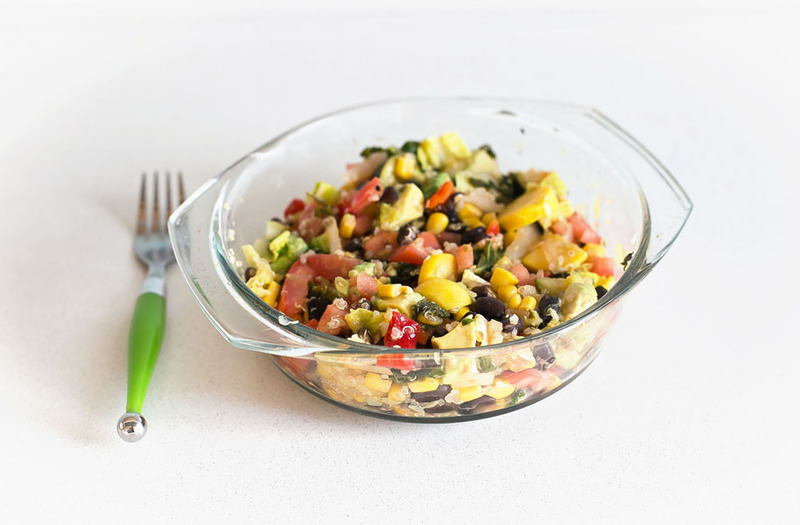 It’s also versatile, since you can substitute veggies as you’d like, as well as brown rice for the quinoa, or other types of bean/protein for the black beans. 1. Prepare the lime-cilantro quinoa: cook the quinoa according to instructions on the package. It should take less than 15 minutes. Also, rinsing before cooking is recommended to wash off the saponin, which can cause reactions in sensitive people. As it cooks, chop up the cilantro. Once the quinoa is done, combine it with the cilantro and half of the lime juice and salt to taste. Set aside. 2. Prepare the black beans according to instructions on the package. For dried beans, this generally calls for soaking them overnight, draining them an hour before dinnertime, covering them with an inch of water and bringing them to a boil, and gently simmering for one hour. You can also try quick-soaking or just cooking without soaking, but it will take longer. Season with salt. 3. Prepare the veggies: chop up the squash, zucchinis, onion, kale, and peppers. Mince the garlic, and sautee it in a medium-large pot with onion until it begins to turn translucent, over medium heat. Then add the squash, zucchini, and kale. Sautee until tender. Add the peppers and corn, and remove from heat. Add the juice from the other half of the lime, along with 1/2 tsp cumin and 1/2-1 tsp of either chili powder, cayenne, paprika, or chipotle powder. (Or mix and match as you like!) Season with salt and pepper. 4. Prepare toppings: slice up 1/2 avocado and 1 small roma tomato per serving; if serving all at once, use 2.5 avocados and 5 roma tomatoes. Chopped/shredded romaine is also a nice addition, about 1/4-1/3 cup per bowl. Add hot sauce or salsa as desired. 5. 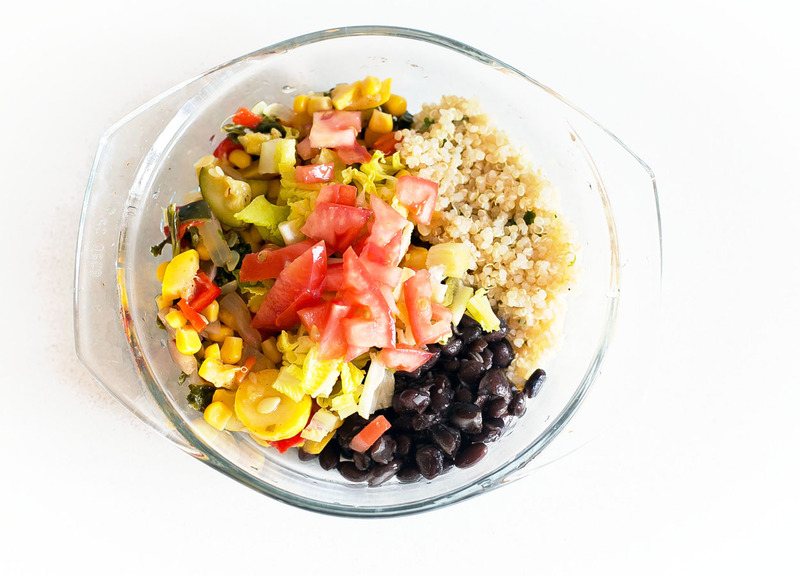 Combine the the quinoa, black beans, veggies, and add the toppings. Eat them separately or mix them all up–it tastes great either way! Lately, I’ve been on a mission to simplify my life in the food department. As much as I’ve loved coming up with new recipes every day, it can get exhausting and takes up a lot of time. So a few weeks ago, I decided to do something drastic: make a dinner that would last me for more than one night, rather than making some whole other new dish the next night like I usually would. And it was a success! Instead of spending an hour cooking an entirely new dinner the next day, I spent that time reading a book and relaxing after a day of midterms. I could get used to this. The pilot meal was a pasta bolognese, and it was delicious! It’s a super simple weeknight dinner, with leftovers that seem to keep getting better and better. I stored the pasta and veggies separately, and each night just had to combine them with the marinara and “beef” crumbles. 1. Prepare pasta according to directions on the package–will vary by type. 2. Prepare your veggies as you’d like: I roasted brussels sprouts and broccoli in the oven at 400 degrees for ~10-15 mins, and sauteed mushrooms and kale together with garlic. 3. 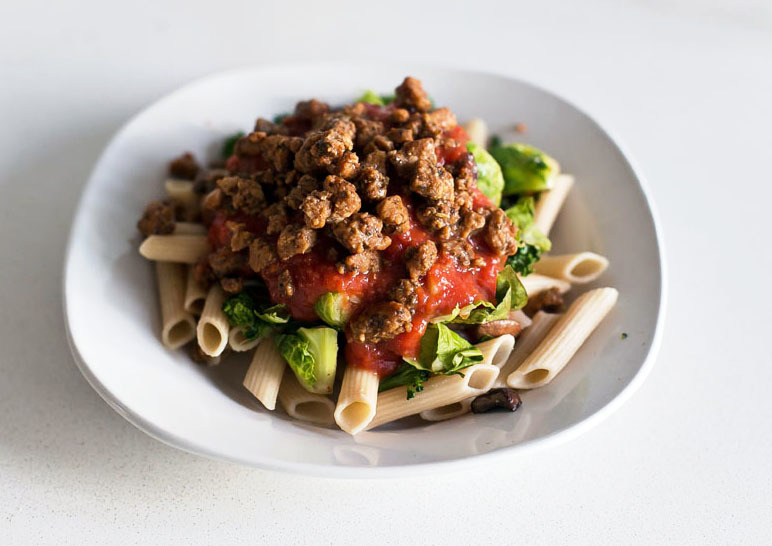 Combine cooked pasta and veggies, marinara sauce, and Beyond meat beef crumbles, and serve hot. 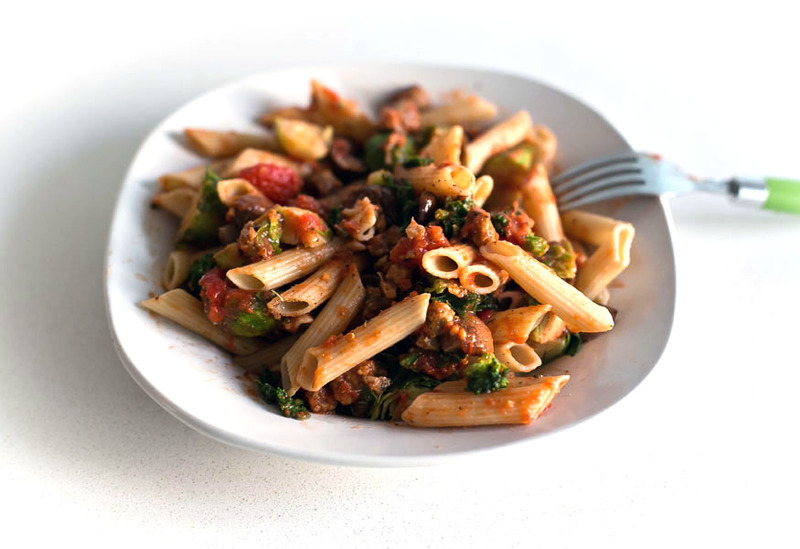 Enjoy your quick and easy weeknight dinner! I’ve Started Designing Vegan-Themed Merch!